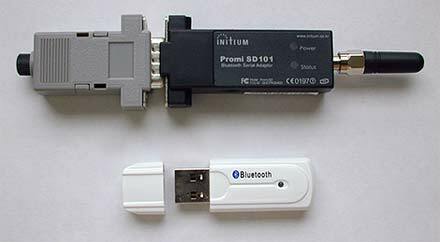 Tele-Infiniti is a telemetry option that eliminates the fiber optic cable between the PC and subject for any Thought Technology encoder capable of transmitting the Biograph legacy mode protocol (19.2 Kbps) running on Windows XP/2000 platform. Tele-Infiniti consists of three main components: a Bluetooth USB Module, a custom programmed Bluetooth Serial Module, and a Thought Technology Fiber Optic to Serial Interface Adaptor. The Tele-Infiniti supports the 19200 baud rate of the Procomp2, and ProComp+ in Biograph Protocol mode, and the ProComp / FlexComp Infiniti in ProComp+ legacy mode. Software Configuration:	Device has been configured to only connect to the Bluetooth USB Module that it is shipped with. Tele-Infiniti is a trademark of Thought Technology Ltd.